Mobile WiMAX is suitable for video-on-demand as well as broadcast TV services. Delivery of video streams over an IP packet-switched network, which includes broadband wireless access, requires rate or congestion control along with methods to protect the compressed stream from the impact of channel conditions. The Chapter considers possible solutions for both these requirements: multi-connection streaming overcomes the risk of poor channel utilization when restraining rates due to detected packet loss, while data-partitioning is a form of error resilience which includes the possible of graceful quality degradation. In the Chapter, ratelesschannel coding is adaptively employed along with error control. The Chapter also surveys the WiMAX option, acknowledging demerits as well as merits of this technology, and considering what other investigations have taken place to deliver multimedia services over broadband wireless. Multimedia services are anticipated to be a key application of broadband wireless access networks (Fazel & Kaiser, 2008), which are supported by both mobile Worldwide Interoperability for Microwave Access (WiMAX) (Institute of Electrical and Electronic Engineers (IEEE) 802.16e (IEEE, 2005)) and Long Term Evolution (LTE) (Dahlman et al., 2008). The focus of this Chapter is mobile WiMAX video streaming. Mobile WiMAX (Jain et al., 2008) provides broadband wireless access independently of a pre-existing cellular system. It is not reliant on hardware authentication (Rather than a Subscriber Identity Module (SIM) card, WiMAX employs digital certificates in a Public Key Infrastructure). Furthermore, it can also deliver data in a cost-effective way (So-In et al., 2010) at approximately 3–4 times the rate of current 3G cellular systems. One additional short-term advantage is that mobile WiMAX is currently deployed and Four Generation (4G) LTE was ratified in December, 2010. Thus, mobile WiMAX is a promising alternative way to deliver multimedia services, supported as it is by leading companies such as Intel and Freescale. As an example, Yota Telecom (Yota TV, 2010) already supports 25 TV channels over its 10 Mbps mobile WiMAX network, which extends to 20 million people in major Russian cities, though Yota are now also considering LTE deployment. The WiMAX Forum has catalogued operation in 140 countries by 475 operators. 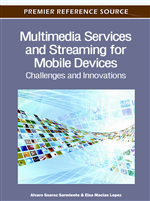 This Chapter examines video streaming techniques that are applied within a mobile WiMAX setting, though, in fact, the techniques are generally applicable within other wireless environments. Two ways developed by the authors to achieve effective streaming over WiMAX are discussed. The first approaches streaming as a source coding problem, using data-partitioning of the compressed bitstream (Mys et al., 2006) to separate out more important data. An interesting observation was made of data-partitioned video by Stockhammer and Bystrom (2004) that while it does not necessarily supply better overall video quality than unicast video without partitioning, because of its scalable nature few instances of poor quality video occur. This is because it is possible to partially reconstruct data-partitioned video without the presence of the lower-priority partition-C. In a novel approach proposed in this Chapter, the more important partition-A and partition-B data output by an H.264/Advanced Video Coding (AVC) encoder (Wenger, 2003) are protected by their smaller packet sizes. Smaller packet sizes arise provided an appropriate Quantization Parameter (QP) is selected. Forward error correction (FEC) is applied at the application layer of the protocol stack in the form of adaptive rateless channel coding (MacKay, 2005). By exploiting the rateless nature of Raptor coding (Shokorallahi, 2006), a scheme is developed in this Chapter that, when required, piggybacks extra redundant data to better reconstruct the compressed bitstream. The second of the approaches developed in this Chapter from the authors’ experience is employed when mobile users are connected by WiMAX to a wired network infrastructure. For example, this could allow one mobile device user to stream over WiMAX through the Internet to another mobile user also connected to a WiMAX Base Station (BS). We have found that multi-connection streaming (Chen & Zakhor, 2006) removes the need for cross-layer interaction, which is a common way to cope with congestion control over the wireless portion of the streaming path. In multi-connection video streaming, a single video source is multiplexed onto several congestion-controlled connections across the wireless link in order to improve the wireless channel utilization, resulting in an increase in throughput. The scheme uses Datagram Congestion Control Protocol (DCCP) (Kohler et al., 2006), which as previously mentioned is an industry standard form of congestion control. DCCP’s main role when congestion occurs is to reduce the video streaming data rate across the wired portion of the concatenated network but unless multi-connection DCCP is used unacceptable streaming delays can arise.